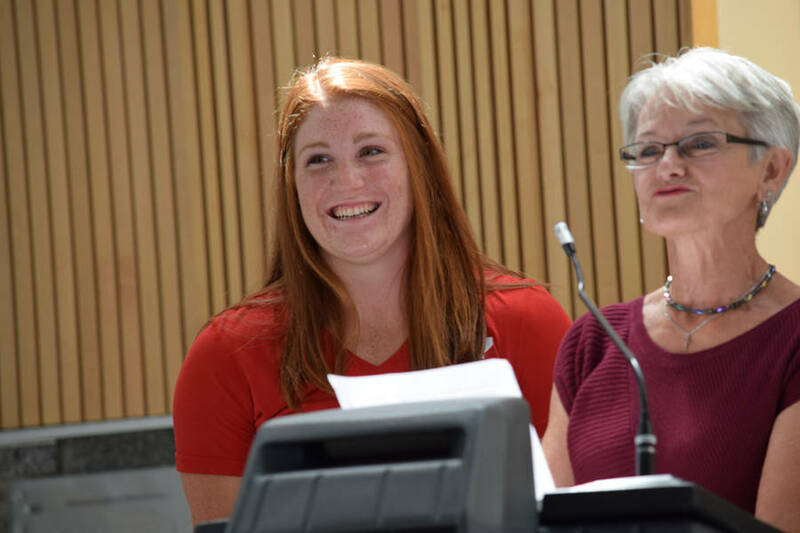 Queens County has paid tribute to its own Sarah Mitton after the 21-year-old athlete returned home with a gold medal in shot put from the Canada Games in Winnipeg. Originally from Brooklyn, Mitton was honoured at a meet-and-greet at Queens Place Emera Centre in Liverpool on August 15 where local councillors, the area MLA and MP, family, friends and others congratulated Mitton on her success. Having come home after her first Canada Games experience, Mitton said winning gold was a proud moment for her. "Knowing the community and knowing everyone, I just knew that when they found out I'd have so much support and so much love sent via social media and everything, the phone calls, it was amazing." Mitton won Nova Scotia's first gold medal at the games after making a 15.61 metre throw in shot put on August 3, beating second place B.C. by 54 centimetres. Her mother Bonnie Mitton had just gotten home from work when she got the call that Sarah had won. Bonnie said she was excited, but admits she wasn't surprised. "She's worked really hard, she deserves it." The years have seen a lot of "ups and downs," said Bonnie, whether it's been trying to get funding and assistance, finding coaches, or transportation. "But I mean overall I think it's taught her a lot, not just about sports, but about different things in life in general, so overall it's been a good experience, I would do it again," she said. "Having the community behind you, and being proud of you, and showing out to support you, I think that's great of Liverpool." Sarah's father, Kirk Mitton, watched his daughter win gold in a live stream of the event online and said Sarah has worked hard all her life. "She's just never given up." Mitton first started throwing in Grade 8, following the encouragement of her teachers. She trained with Bluenose Athletics in Bridgewater and most recently as a student at the University of Windsor in Ontario. Mitton stepped up her training this summer after relocating to Toronto to work with a coach from Athletics Canada. She has gone on to become a two-time Athletics Nova Scotia junior athlete of the year, a national junior champion, Canadian university medallist and provincial senior women's indoor record holder. Even though she is home, Mitton continues to train in preparation for the 2017 Summer Universiade, also known as the World University Games, in Taipei later this month. "Ultimately when you're at these events you have to know you put in the work," she said, "so those are the sacrifices you have to make." Deputy mayor of the Region of Queens Municipality Susan MacLeod said Mitton's "strength in shot put was evident early on," adding that Mitton has made her mark in Canadian sports. "Sarah, all of Queens County is very proud of what you have accomplished." MP for South Shore-St. Margaret's Bernadette Jordan said her own son competed in the Canada Games in 2007, so she knows what Sarah has gone through. "It's so exciting to see our young people doing so well on the national stage," she said, adding that everyone was really proud of Sarah. MLA for Queens-Shelburne Kim Masland said she was extremely excited to see Sarah back with a "lovely gold medal." "It's a very proud moment for Sarah, but also a very proud moment for everyone who lives in this community that has pretty much watched Sarah grow from an infant to where she is today." Masland remembered how Mitton used to work at the local Chinese restaurant in Liverpool. "So not only is she a great server, she is an amazing athlete and we in Queens County are truly privileged to have her as one of our residents."